Department of Health (DH) – The VCSE Health and Wellbeing Programme provides funding to voluntary, community and social enterprise organisations to help them contribute towards improving health and care. Each round of the programme focuses on a specific theme and the theme for this round is social prescribing. The department is inviting applications to set up a new social prescribing scheme or to support the expansion of an existing scheme. The deadline for completed applications is 21 November 2017. Note. Limited funds are available so apply soon to avoid disappointment. 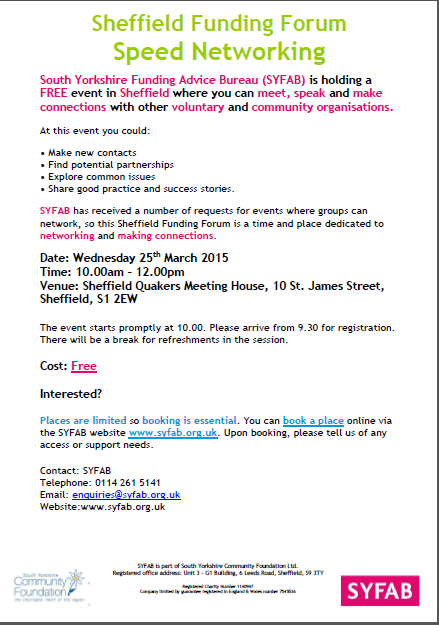 Sheffield Funding Forum Speed Networking Event FREE. 25th March.